A long-serving judge has been ordered to spend nearly 30 years in prison for his role in a bribery scandal that prompted the state's high court to overturn thousands of juvenile convictions. Former Luzerne County Judge Mark Ciavarella Jr was sentenced on Thursday to 28 years in prison for taking $1m (£617,000) in bribes from the builder of two juvenile detention centres in a case that became known as "kids-for-cash". The Pennsylvania supreme court overturned about 4,000 convictions issued by Ciavarella between 2003 and 2008, saying he violated the constitutional rights of the juveniles, including the right to legal counsel and the right to intelligently enter a plea. 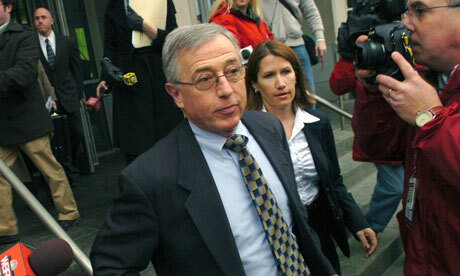 Ciavarella, 61, was tried and convicted of racketeering charges earlier this year. His lawyers had asked for a "reasonable" sentence in court papers, saying, in effect, that he had already been punished enough. "The media attention to this matter has exceeded coverage given to many and almost all capital murders, and despite protestation, he will forever be unjustly branded as the 'kids for cash' judge," they said. Federal prosecutors accused Ciavarella and a second judge, Michael Conahan, of taking more than $2m in bribes from the builder of the PA Child Care and Western PA Child Care detention centres and extorting hundreds of thousands of dollars from the facilities' co-owner. Ciavarella, known for his harsh and autocratic courtroom demeanour, filled the beds of the private lockups with children as young as 10, many of them first-time offenders convicted of petty theft and other minor crimes. The jury returned a mixed verdict following a February trial, convicting him on 12 counts, including racketeering and conspiracy, and acquitting him on 27 counts, including extortion. The guilty verdicts related to a payment of $997,600 from the builder.